I just returned from 5 days out in Azawak with Moustapha, Ariane, Denis and Yannick. It was an amazing experience. They are really working hard and thinking hard about the ways to help the people in this region. I am so happy to be a part of this project. Ariane sent me back here to Niamey with the attached update for you to post. She also sent me with some pictures, which I will forward on to you once I get to the US (where there is high speed internet!). Team Amman Imman arrived in the Azawak one week ago. We have been seeing and living the beauties and hardships of life here, and have witnessed people’s daily struggle for survival searching for water. Firstly, I want to reassure everyone that our team is faring well despite the tremendous heat, fatigue, and emotional difficulty seeing people suffer firsthand. Mary, our geologist, arrived last Sunday, and has been a true asset as we have been gathering coordinates for possible future sites, and determining the geological layout of the area. Thanks to the first borehole we built in Tangarwachane, we have not personally suffered from a lack of water. It has been very exciting to see how significantly the lives have changed of the communities living near the borehole. When I lived with these same communities in 2005 and 2006, all the children and adults were chronically sick and covered in filth and pests. They survived off of marsh water, or well water often no less contaminated. Everyone was exhausted from their daily search from water. Today they are clean and healthy, and children have time to play, and soon time to go to school. The school is in its final phase of construction and should be opening in the next few months. We are now working to improve the management committee, particularly concerning the maintenance of the pump and sensitization concerning hygiene and sanitation. 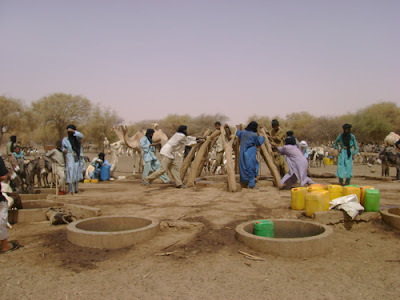 We have also determined that the solar panel pump is not appropriate for this area (its use at such great depths is not sustainable), and are discussing with the population the improvements they would like to make in particular, such as a bigger cistern, more faucets, drink basins for the animals, etc. We have also visited up to 15 sites, and are giving special consideration for two sites where we think a borehole would serve a large number of people, and where the population has asked for a borehole and has shown the capacity to maintain it after construction. Life for most of the people here is not as easy as for the communities living near Tangarwachane. This year the rainy season lasted fairly long, and so most people are surviving off of marsh water that has seeped into the ground. They have dug holes in the dry marsh lands from 6 to 20 meters deep to pull out just a few 20 liter jugs worth of water for their families and their animals. Hundreds of animals, large and small, wait their turn to drink a few sips of water. 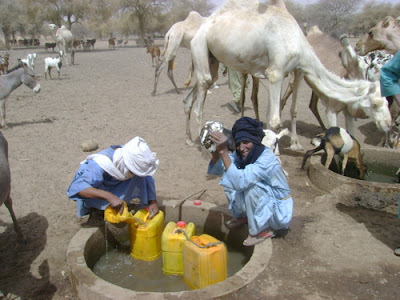 People often spend days at one of these wells waiting hours at a time for small quantities of water to seep into the well and provide a few more liters of water for their family members and livestock. 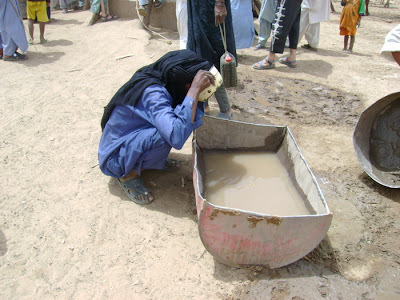 This water is contaminated with animal excrement and often has the consistency of mud rather than water. 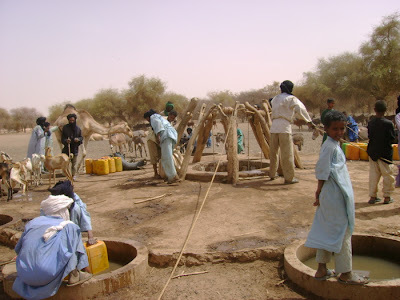 The deeper of the shallow wells, up to 120 meters deep, do not provide relief because they do not contain more water than the marsh wells, and they also dry up for hours or days at a time depending on how many people use them. When the wells go dry, young boys or men are sent down to dig deeper. Sometimes the wells collapse on them, but this is a necessary risk to take for the hope of having just a little more water. Four donkeys and the strength of several grown men are needed to pull the water up from such great depths. 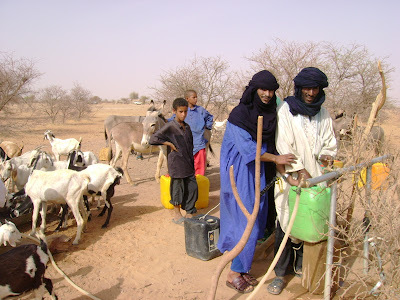 The work is so grueling that the donkeys can only pull up a few buckets of water before having to be replaced. 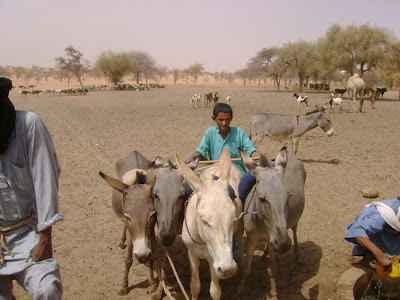 They must almost be beaten to be forced to move and haul and pull, and we even saw donkeys fall over from exhaustion. Just filling a bucket at such a great depth takes a lot of strength and time. At one well we calculated that it took 8 minutes to pull the bucket up out of the well with the strength of several men and four donkeys, and a least a few minutes more simply to fill the bucket before pulling it up. This exhaustion is compounded by the distance that people have to travel to find these few non sustainable and contaminated sources of water. One boy was so exhausted the other day that he dropped a bucket filled with water after pulling it up 120 meters. He and the other children and men stood in disbelief as the muddy water spilled over and then seeped into the sand. I wanted to hold him when I saw tears of sadness swell in his eyes, knowing that he had lost most of the water he was going to bring home to his family that day. People are thirsty. They are so thirsty that they drink anything they find. It is so hot now, up to 115 to 120 degrees. They are exhausted. But they do not give up, and continue their daily struggle traveling from water point to water point, sometimes over 30 miles, just to find a sip to stay alive. I am sending this message along with Mary who is going back to the USA on Friday so that you do not forget the people of their Azawak: their courage and their daily struggle for survival in a land without water. We will stay here in the Azawak for at least a couple of weeks, learning more and selecting good sites for new boreholes.